Again research is key. 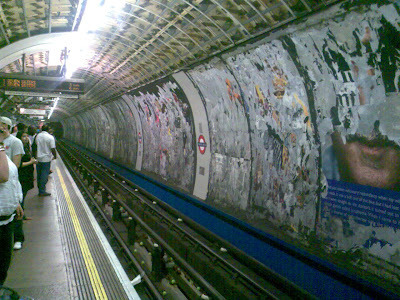 Find out what route your chosen publisher takes and then plaster your script all over the tube walls. You'll have to tear down the existing posters first ( See picture above for one I've prepared earlier) then paste them all up. It might help to use a font higher than the 12 point your publisher normally asks for and to wear rubber boots. Enjoy Christmas and send me your book once it is in print - signed with a mince pie would be nice. That's signed by you with a mince pie. No sorry, that's signed by you with a pen and a mince pie. No! Stella help! - see how important sentence construction is! Finally, I something I'm (sorta) qualified for! I could so do the wallpaper thing! Wait, let me get my roller. I'm afraid I can't help you with sentence construction, Mr. Ranger. I'm never sure where to punctuate and I like splitting infinitives. Lone Ranger stop chatting up the readers - sorry Beth - good luck with your writing in 09.